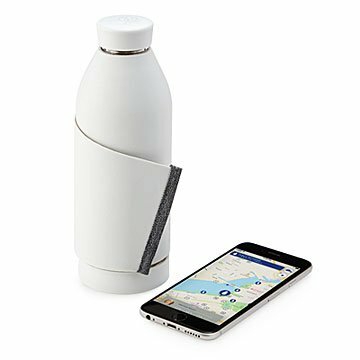 This high-design water bottle has an integrated strap, and an app that leads you to nearby water stations. We're not so sure that some water has a high IQ. But we know this is an intelligent water bottle. Looks-wise, it's next-level smart: sleek and modern, in matte white with a gray stripe. It's clever, too: the stretch silicone flap wraps securely around a bag or backpack strap, bike frame, or stroller handle with a simple but secure hidden magnetic closure. A second opening on the bottom makes it easy to add ice, fruit, or tea, and later, get it really clean. Its tough borosilicate glass is resistant to falls and knocks, as well as high and low temperatures. Finally, the brains: an app that locates the closest places to refill it for free. No more disposable bottles for you, ever. That's genius. A practical "wow" gift for travelers, commuters, bikers, and style mavens of all stripes, it's designed in Spain and made in China. 8" H x 2.7" Dia. Place in upper shelf of dishwasher for easy cleaning. Do not expose to temperatures higher than 122 °F.